After deliberating in the first half of the session, the NIFTY attempted to move past its 50-DMA and 200-DMA and inch higher. The Markets ended in the green for the six day in a row with the NIFTY gaining 41.50 points or 0.40%. 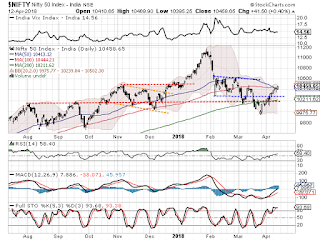 The Markets saw a brief consolidation near the 50-DMA and the 100-DMA mark which remain in extremely close vicinity at 10413 and 10444 respectively. As we approach the last trading day of the week, we may again see Markets opening on a quiet note. The zone of 10480-10500 zones will be important and if these are not clearly breached on the upside, the Markets still remain prone to consolidation and some profit taking bouts at higher levels. However, the undercurrent continues to remain buoyant. The levels of 10480 and 10535 will play out as immediate resistance area for the Markets. Supports come in at 10415 and 10365 levels. The RSI on the Daily Chart is 58.4023 and it has marked a yet another 14-period high which is bullish. However, RSI continues to remain neutral showing no divergence against the price. The Daily MACD stays bullish while trading above its signal line. On the Candles, and engulfing bullish line occurred. This is not out rightly bearish but it certainly warrants some caution at current levels as this formation has occurred after an up move. This has potential to halt the up move temporarily and push the Markets into some consolidation. As of now, pattern analysis suggests that NIFTY has managed to inch higher than its 50-DMA and 100-DMA and has managed to close a notch above that. However, given the present structure of the Chart, we still cannot rule out some consolidation at higher levels. Overall, there is no denying the fact that the undercurrent remains buoyant. However, we cannot overlook the present short term formations which point towards likely consolidation happening at current levels. We see high probability of Markets witnessing some profit taking bouts at higher levels with very limited downsides. Also, the high PCR levels (Put to Call Ratio Levels) too point towards some likely pause in the up move. While expecting Markets to consolidate at higher levels, we advise vigilant protection of profits at higher levels while continuing to use downsides to make select purchases. Favorable technical setup is observed in stocks like KPIT, TCS, SUBEX, INFIBEAM, M&M Financial, CAMLIN FINE SCIENCES, RADICO KHAITAN, CYIENT, TATA CHEMICALS and JAI BHARAT MARUTI.